The Treasury of Scripture Knowledge is a tool for interpreting Scripture with Scripture. Each verse of the Bible is cross-referenced to several others to enable the reader to gain a true sense of each word and phrase as it is used in the Bible. Watch this video to see how the integrated KJV-TSK works. Originally printed in a 700+ page book and now enhanced with two-way cross-referencing, this entire reference is available to you in SwordSearcher. With a single click next to any verse in the Bible, you have instant access to the most exhaustive cross-reference list available. The Treasury is available in two forms in SwordSearcher. The commentary-form is in the TSK commentary and includes all of the cross-references and the supplementary material (marginal readings and short commentaries, outlines, etc). 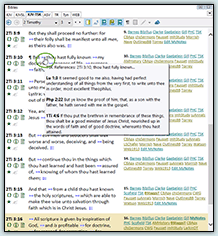 The KJV-TSK Bible tab integrates all of the cross-references right into the Bible text for super-fast and convenient access. 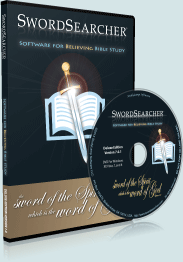 New in SwordSearcher 8! 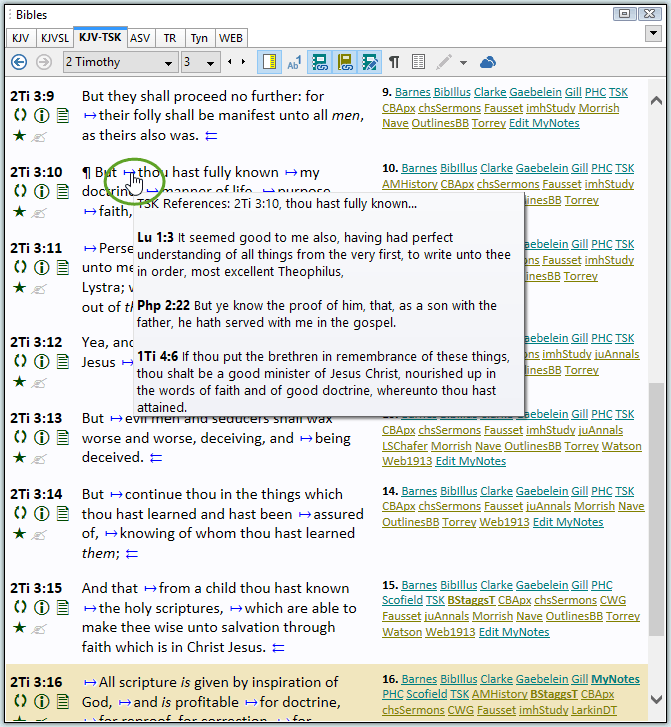 The 800,000+ cross-references from the Treasury of Scripture Knowledge are now integrated right into the Bible text, complete with in-line references, general references, and "reverse" references. 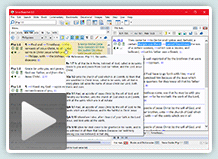 Hold your mouse over the notation to preview cross-referenced verses, and click to open them in a verse list panel. In addition to cross-references attached to specific words in the verse, there are general cross-references for verses linked at the end of the verse text, and reciprocal references which link from other verses to the presently viewed text. The original Treasury of Scripture Knowledge is one of the most valuable Bible reference works ever to be published. Unlike a typical commentary, the TSK consists primarily of scripture references with very little "comment." Of course, there are "illustrative notes" (as so described by the original publisher), which include book summaries, chapter outlines, short explanations, and alternate readings often found in the margins of the Authorized Bible. However, the TSK remains unique in that its primary purpose is to present the reader with copious cross-references so that the Bible student may allow Scripture to be illuminated by the whitest of lights: Scripture itself. The original work was described as having "five-hundred thousand Scripture references and parallel passages." This was undoubtedly an estimate, as no infallible means of creating an accurate tally of such references existed in the 19th century. In reality, the actual cross-reference count was about 340,000. Also, the original text did not always consistently provide for reciprocal cross-referencing. That is to say, a reference from Genesis 1:1 to Exodus 20:11 did not necessarily appear in the reverse (Exodus 20:11 to Genesis 1:1), so the student could easily miss valuable cross-references. To be sure, however, the work of creating the TSK was extremely laborious and done at a time when its authors had only paper books to create their lists of verses, so its great achievement is in no wise diminished by these minor imperfections. To expand upon their work, in the manner in which is done so in this SwordSearcher edition of the text, is merely to make it more complete. Thousands of errors common in digital editions of the TSK have been corrected. In-line scripture references have been made reciprocal when a corresponding back-link did not exist. In the case where a referenced verse contained the same "linked" phrase, the reciprocal link has been appended to the same "phrase" verse list in the referenced verses. In cases where an exact match of the linked phrase does not exist, the reciprocal link is noted at the end of the comment text. In both cases, the term exp: in the text indicates the verse links are unique to this expanded edition of the TSK. General cross-references have also been made reciprocal. As above, the added verse links are noted with the term exp in the text. In order to minimize the occurrence of apparently confusing reciprocal links, passage references containing more than 5 consecutive verses are not included in the appended verse lists. The text of each entry has been formatted to better suit the format of screen display in SwordSearcher. Book summaries which appear at the end of each book in the original work have been moved to the beginning of each book, on verse 1:1. The resulting edition contains about 800,000 cross-references throughout. About twenty years ago I saw for the first time “The Treasury of Scripture Knowledge.” I was interested in the book at once, and commenced to use it in my daily study of the Word of God. I went through book after book of the Bible, verse by verse, with the aid of “The Treasury.” I found that it enabled me, better than all the commentaries, to come to a true knowledge of God’s meaning. There is no other commentary on the Bible so helpful as the Bible itself. There is not a difficult passage in the Bible that is not explained and made clear by other passages of the Bible, and this book is marvellously useful in bringing to light those other parts of the Bible that throw light upon the portion that is being studied. But not only does the book illuminate dark places, it also emphasizes the truth by bringing in a multitude of witnesses. It also greatly strengthens faith, for one cannot study his Bible with the aid of “The Treasury of Scripture Knowledge” without getting a deeper conviction of the unity of the entire Book. As he compares Scripture with Scripture and sees how what Paul says fits in to what Jesus said, and John said, and Peter said, and Isaiah said, and the Psalmist said; when he sees how every doctrine of the New Testament regarding Christ, His Divine-human nature, His holy character, His atoning death, and His resurrection, ascension, and coming again is enfolded in the types of the Pentateuch, Prophets, and Psalms, he becomes overwhelmingly convinced that the whole Bible has one real Author behind the many human authors. 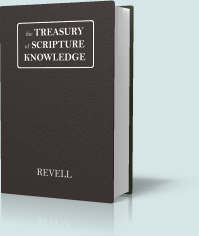 “The Treasury of Scripture Knowledge” enables on, not only to understand the Word, but to feed upon the Word. In preparing notes on the Sunday School lessons for publication, and notes on the various books of the Bible, I have found more help in “The Treasury of Scripture Knowledge” than in all other books put together. I have recommended the use of the book to many people, and in after years they have thanked me for calling their attention to this book. Their experiences with it have been similar to mine. One great advantage of the book is its portability. One who has to travel much cannot take a large number of commentaries with him, but in “The Treasury of Scripture Knowledge” he will find the substance of all that is best in many commentaries. See also the TSK Tutorial.